Is Hunger Games: Mockingjay part 1 worth seeing? The Hunger Games as a film franchise has delivered in entertainment and at the box office. The film franchise has made 1.8 billion. The Hunger Games: Catching Fire was an extreme success compared to its successor, The Hunger Games; however, the first part of the final trilogy does not deliver. The first two Hunger Games films had an intense pace but this film lacks intensity and action. It replaces these two components for dull meaningless love triangle and dull drama. The saving grace of the film is the acting and Donald Southerland as President Snow. Mockingjay takes place right after Catching Fire ended. Katniss Everdeen is with the rebels and her lover or husband, Peeta, is in the capital. Katniss is reluctant to side with the rebels while Peeta becomes a spokesman for the capital and President Snow. Peeta urges the districts to end rebellion while Katniss is having PTSD. Katniss makes a deal with President Coin who is in charge of the rebels that she will lead their rebel for exchange for Peeta getting a pardon from pro capital telecasts. President Coin is completely jealous of Katniss. The question of the film is; Can Katniss save Peeta from President Snow instead Can Katniss and the rebels end President Snow’s tyranny? Mockjay fails because the story fails. This installment of the Hunger Games is boring and dull. 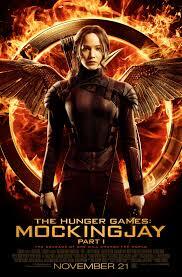 It is super repetitive and lacks the intense action that made Hunger Games a great film franchise. The Mockingjay is 400 page book. The filmmakers decided to forgo of making a coherent film with action, romance, and battle scenes and replaced with a Nicholas Spark’s love story with Peeta, Katniss, and Gale for 2 hours. We couldn’t get a film with a good storyline in film trilogy. Lord of the Rings: Return of the King and Star Wars: Return of the Jedi is an example of this. They made a film that is choppy and focuses on to much of the Peeta, Katniss, and Gale love triangle. Katniss apparently goes through post traumatic stress syndrome and needs the first 45 minutes of the film to figure out if she wants be the Mockingjay. Honestly, the Mockingjay has never been full explained why it is symbol to the rebels. The acting of one man particularly does save casual film going audience’s interest to go see The Hunger Games: Mockingjay Part 2. Donald Southernland has given a pretty astounding acting performance that puts him into film history. His character, President Snow, is one of the most evil, manipulative, and sadistic characters to grace the film screen. His character is the human version of Lord Voldermort. Snow will bomb a hospital, set traps, blackmail citizens, and is power hungry. He will do anything to keep his position because he believes that he is doing the right thing. Southerland gives the character a sense of purpose and it brings his screen time to life. As an audience member, more screen time for President Snow is a great thing. He drives the story while the other heavy dramatic plot points drags the movie down. Overall, Hunger Games Mockingjay Part 1 is a lackluster film. Fans of the book might love it but this critic would rather see the Spider-man stalk Gwen Stacey five straight times in the Amazing Spider-man 2 instead of ever watching this awful Nicholas Spark’s love story ever again. Sorry, the filmmakers decided to go for money and not making a film that could be as great installment to a film trilogy such as Lord of the Rings: Return of the King or Star Wars: Return of the Jedi. Hunger Games: Mockingjay part 1 gets a 2 out of 5. Hey, at least it is not Transformers 4.